Due to Michigan Union renovations, CAPS has temporarily moved. The Wellness Zone (WZ) at CAPS Central Office will return in Winter 2020! Currently, the North Campus (Pierpont) WZ and Munger WZ are open! Wellness is a proactive and positive approach to living that increases resiliency to stress by promoting life balance and contentment. True psychological wellbeing is an ongoing, ever changing process that is unique for each individual. Our wellness philosophy at CAPS affirms the multifaceted needs of the "whole student", including the mental, social, spiritual and other aspects of self. We believe a holistic approach to understanding student experience is critical to providing optimal emotional wellness services at CAPS. CAPS Wellness Zone (WZ) is available for students on a drop-in basis! 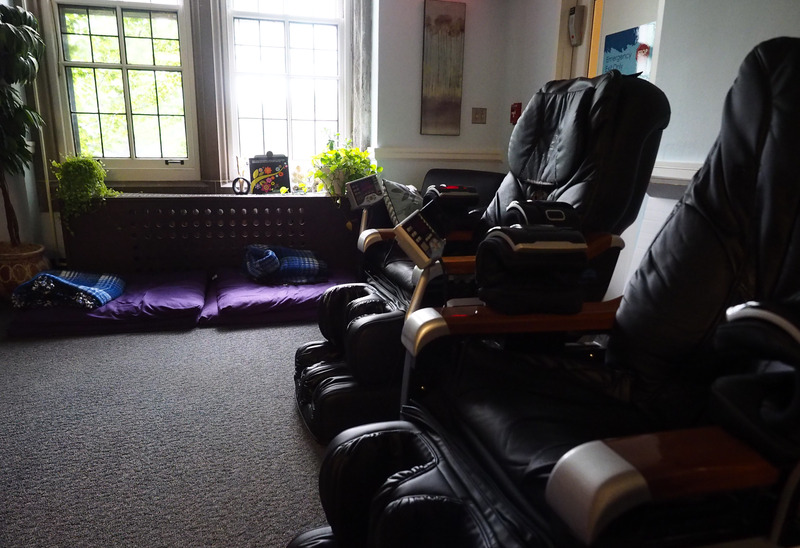 We offer many wellness resources to help you manage stress, rest and relax as you navigate your busy life as a student at U of M.
Wellness approaches available in the WZ include three state of the art massage chairs, yoga and meditation tools, Xbox Kinect system, biofeedback software, seasonal affective disorder light therapy and other wellness resources. The WZ Central is open during CAPS hours, Fall/Winter: 8 a.m.-7 p.m. Mondays through Thursdays, and until 5 p.m. Fridays. UHS: What does wellness mean to students?